Guys, warmer days are coming. It looks like we need to brush up on our summer food and beverages for our guests. Upon checking the weather for Raleigh, I saw a headline that says an abnormal start to summer is coming in the next couple of months. I'm not sure if this is for all of the U.S., but it's certainly believable for us here in the South after our 78°F February days. This Cucumber Mint Mojarita Cocktail (Mojito + Margarita hybrid) is a wonderfully refreshing beverage to serve guests when the heat sets in. Honestly though, this is one of my favorite guest entertaining cocktails to make any time of year. Mojito and Margarita lovers, unite! This drink has a nickname around our house. It's called.... "The Mallory" haha! That's because this is probably in my top 3 favorite homemade cocktail creations I love to make. Last summer, I'm pretty sure I had everyone that visited our house try this one out. You know, they weren't mad about it. In fact, I had most everyone hooked. It wasn't a problem for me to keep cranking them out during our barbecues and pool parties because they are SUPER easy to make. The cool cucumber and sparkly lime soda will transport you into a five star spa somewhere tropical with clear waters from the first sip... ah, I can see it now. No seriously, this recipe definitely is reminiscent of the fancy cucumber spa water served and could be an excellent addition to a girls spa day/night at home without having to skip town. This drink could also be converted to a Mocktail or Spritzer simply by leaving out the Tequila. You would still catch all the cucumber-mint goodness with the bubbles of lime soda. 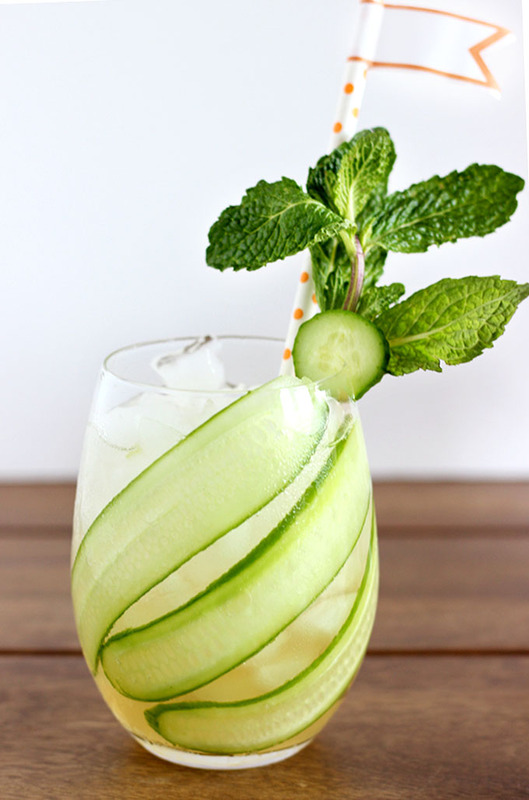 In a shaker, muddle together a couple of fresh mint leaves and about a tablespoon of diced cucumber. What I would do is slice a few cucumber rounds and then dice and throw into the shaker. This will start bringing out all the wonderful flavors and aromas of the cucumber and mint. Do this for 5-10 seconds. Then measure 1 oz. of freshly squeezed lime juice (fresh makes all the difference!) and pour into shaker along with the 1.5 oz. of tequila and give it a stir. Pour this mixture into your final serving glass or cup then top with 3-4 oz. of natural cane sugar sweetened (or stevia sweetened for 0 calorie) lime soda depending on how sweet you like it and the size of your glass. For garnish, I like to slice another few cucumber rounds and reserve a few mint sprigs to enhance the final presentation. If you'd like to easily get even fancier, you can create these cucumber stripes in the glass, as I did in the photo, with just a few steps. I promise your friends will be SO impressed. Take a small, washed cucumber and peel a few strips from end to end so that you remove the dark outer green skin with a vegetable peeler or pairing knife. Then, cut a few thin strips (3 or 4) and lay them to the side. Grab your clear glass and turn it sideways. Then take your cucumber strips and stick them to the inside of the glass, one by one. You can layer them on top of one-another vertically or diagonally.Once you have them in place, keep the glass turned on it's side so that the cucumber slices are laying flat while you prepare the drink. Then, once you make the drink with the exception of the soda, gently pour into the cucumber slice-lined glass and top with the soda. What garnish tips & tricks do you all use to take your drink presentation to the next level? I'd love to know - comment below!